Syrian President Bashar al-Assad, center, meets with a Russian delegation of parliamentarians in Damascus, Syria, in a handout picture released by the Syrian Arab News Agency, Oct. 25, 2015. Syrian President Bashar al-Assad reiterated his focus on eliminating the threat of terrorists in his country, saying Sunday that would lead to the political solution that Syrians seek to the crisis they have endured for more than 4½ years. 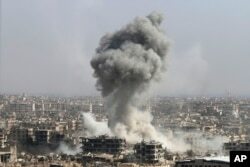 Assad met with a group of Russian lawmakers and other officials in Damascus, and the state-run SANA news agency said. One member of the Russian delegation, lawmaker Alexander Yushchenko, relayed that Assad said he was prepared to take part in a new presidential election, as well as holding a vote for parliament, if that is what the Syrian people want. The Russian Foreign Ministry said Sunday that U.S. Secretary of State John Kerry and Russian Foreign Minister Sergei Lavrov discussed in a phone call the "prospects" for an internationally backed political settlement in Syria that would involve Syrian authorities and "patriotic opposition." 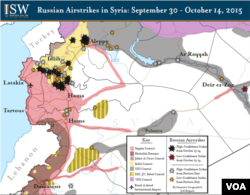 Russia has backed Assad politically and militarily, while the United States believes Assad should not be part of any long-term political resolution to Syria’s conflict. Kerry on Friday announced plans for a broad international meeting on Syria during the coming week. "This is a multilateral, collegiate effort, and there are no self-appointed leaders. We are just trying to explore ideas," Kerry said after talks with Lavrov in Vienna, emphasizing that all participants would be equals. "We look forward to expanding to countries that have a great deal of concern about this." A meeting location has not been announced. Assad is serving his third term as president after he was elected for another seven years last year. That vote was held only in areas controlled by the government and was boycotted by the opposition. Assad won 89 percent of the vote. Since then, Islamic State militants seized large areas in eastern Syria, including the group's de facto capital in Raqqa. About 30 percent of the more than 240,000 people who have been killed in the Syrian conflict have died since the vote, while the United Nations registered another 1.3 million refugees who fled the country.More than 4 million have fled since the civil war began. Russian Foreign Minister said Saturday that Russia wanted Syria to prepare for elections and indicated that his government would take firm action, if necessary, to move that process forward. He did not, however, give specific details about how there could be a transition from years of civil war in Syria to a political settlement. 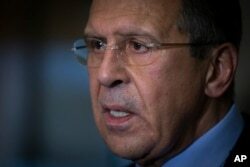 Russian Foreign Minister Sergei Lavrov says Moscow wants Syria to prepare for parliamentary and presidential elections. "External players cannot decide anything for the Syrians. We must force them to come up with a plan for their country where the interests of every religious, ethnic and political group will be well protected," Lavrov said. "They need to prepare for both parliamentary and presidential elections." He also criticized U.S. policy on Syria and denied Western charges that Russia's airstrikes in Syria have indiscriminately targeted anti-Assad rebels backed by the Western coalition as well as Islamic State extremists. Lavrov said Russia's air force would be ready to help units of the "patriotic opposition" in Syria – specifically the Free Syrian Army, rebels supported by the United States – if it knew their whereabouts. He contended that the U.S. and its allies have refused to provide information about the rebel units' locations, or to "coordinate" their anti-terrorist campaign against Islamic State extremists with Russia's military. Reacting to Lavrov’s statement, Free Syrian Army rebel fighters said that Russia must stop bombing them, before talking about helping them. Western-backed Syrian rebels rejected Moscow’s idea of elections, which they suspect as a strategy for keeping Assad in power. Lavrov also spoke by telephone Saturday with Kerry. A Russian Foreign Ministry statement said the diplomats exchanged views "on the need to utilize the potential of other countries in the region to advance the political process." The U.S. State Department added that Kerry and Lavrov discussed potential future multilateral meetings and their shared push for ways to "achieve a political transition." Kerry later met with Saudi King Salman for talks that included the need for Syria to "transition away from Assad" and a pledge by the United States and Saudi Arabia to support moderate opposition groups while pursuing a political resolution.